Instead of pranking, Wichita public school students and their leaders might consider a few facts. 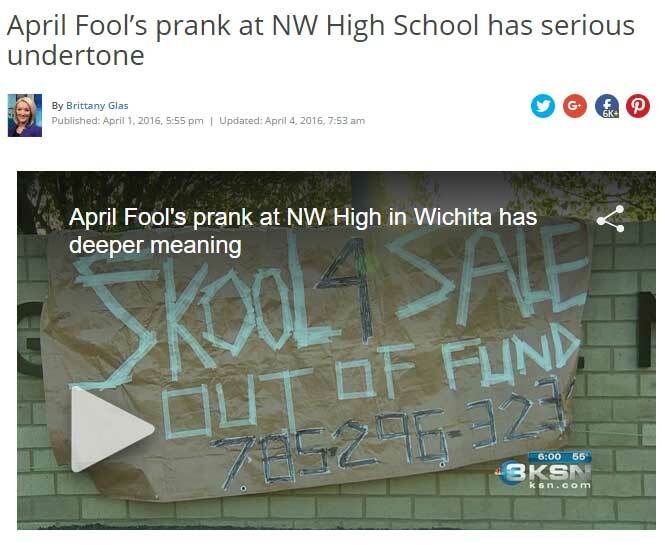 KSN News reported on an April Fools’ Day prank at Northwest High School in Kansas. The message is that the school is short of funds. When looking at this story, I wonder how the pranksters — likely students at the school — developed an opinion of issues like school funding. Who told them there was a “funding crisis?” Is that an opinion high school students developed on their own, or is it an opinion spoon-fed to them? The quotes from school district leaders provide the answer to that question. Enrollment and Employment at Wichita Northwest High School. Click for larger. Looking at the number of school employees strips away most of the confounding factors and concentrates on the largest, and most important, cost schools face: Teachers and other employees. As it turns out, Wichita Northwest High School shouldn’t be complaining about a funding crisis. For one thing, enrollment at this school is falling, from 1,580 in 2009 to 1,399 in 2015, a decline of 11 percent. While the number of teachers and certified employees has varied, the ratios of students to these employees has been level or declining. 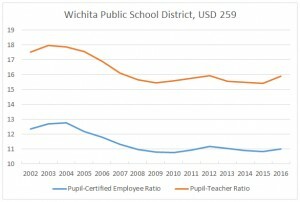 Employment ratios in the Wichita school district. Click for larger. 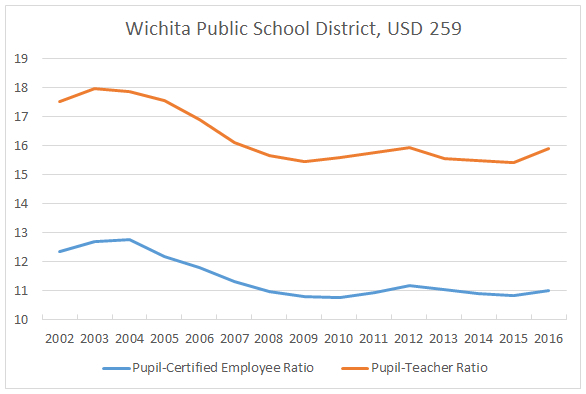 For that matter, the ratios of students to teachers and certified employees for the entire Wichita public school district is on a long downward trend, with small interruptions. KAKE Television reports on Wichita parents who are not happy with treatment by the school board, writing “Parents associated with Hyde tell KAKE News it’s not the decision that’s leaving a bad taste in their mouth. They’re unhappy with how the Wichita Board of Education treated them during the process.” Wichita Eagle reporting on this matter is at Wichita school board votes to transfer two teachers from Hyde Elementary. This is not the first time citizens have suffered in this way. When a person like Lynn Rogers and most other school board members believe that they are totally responsible for — and the only reason why — any education takes place in Wichita, superciliousness and insularity are occupational hazards. When she was president of the board of USD 259 Betty Arnold let citizens know the real purpose of board meetings, and how citizens should behave. At a meeting, citizens had criticized the board for large and important issues, but also for such mundane things as the amount of the superintendent’s monthly car allowance. Arnold admonished citizens for speaking about things like this in public. It’s not respectful, she said. Video of Arnold is below, or click here to view at YouTube. Responses to records requests made by Kansas Policy Institute are bringing attention to shortcomings in the Kansas Open Records Act. Those who have made records requests in Kansas are probably not surprised that KPI has had difficulty in having its records requests respected and filled. In 2007 Better Government Association and National Freedom of Information Coalition gave Kansas a letter grade of “F” for its open records law. Last year State Integrity Investigation looked at the states, and Kansas did not rank well there, either. See Kansas rates low in access to records. This week KPI president Dave Trabert appeared before the Sedgwick County Commission to express his concerns regarding the failure of Greater Wichita Economic Development Coalition to fulfill a records request made under the provisions of the Kansas Open Records Act. Video is at Open government in Sedgwick County Kansas. While commissioners Karl Peterjohn and Richard Ranzau spoke in favor of government transparency and compliance with records requests, not all their colleagues agreed. Dave Unruh asked Trabert if GWEDC had responded to his records request. Trabert said yes, and the response from GWEDC is that the agency believes it has complied with the open records law. This, he explained, is a common response from agencies. 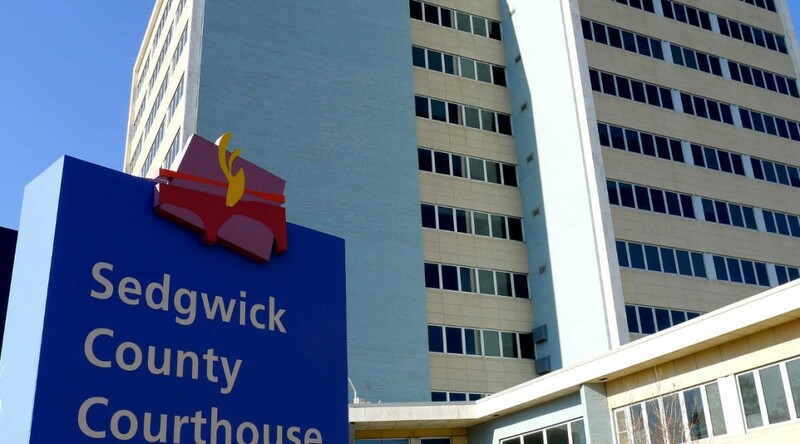 Commission Chair Tim Norton expressed concern that any non-profit the commission gives money to would have to hire legal help, which he termed an unintended consequence. He made a motion to receive and file Trabert’s remarks, which is routine. His motion also included taking this matter under advisement, which is what politicians do in order to bury something. Unruh seconded the motion. Peterjohn made a substitute motion that a representative from GWEDC would appear before the commission and discuss the open records act. This motion passed four to one, with Unruh in the minority. Even though Norton voted in favor of Peterjohn’s motion, it’s evident that he isn’t in favor of more government transparency. Unruh’s vote against government transparency was explicit. USD 259, the Wichita public school district, also declined to fulfill a records request submitted by KPI. In a press release, KPI details the overly-legalistic interpretation of the KORA statute that the Wichita school district uses to claim that the records are exempt from disclosure. This claim by Rogers — if sincere — is a break from the past. In 2008 Rogers told me that it is a burden when citizens make requests for records. Until recently the Wichita school district had placed its monthly checkbook register on its website each month, and then removed it after a month had passed. Rogers explained that the district didn’t have space on its servers to hold these documents. That explanation is total nonsense, as the pdf check register documents are a very small fraction of the size of video files that the district hosted on its servers. Video files, by the way, not related to instruction, but holding coverage of groundbreaking ceremonies. KPI has made records requests to other local governmental agencies. Some have refused to comply on the basis that they are not public agencies as defined in Kansas statutes. This was the case when I made records requests to Wichita Downtown Development Corporation, Greater Wichita Economic Development Coalition, and Go Wichita Convention and Visitors Bureau. The following year when WDDC’s contract was before the council for renewal, I asked that the city, as part of the contract, agree that WDDC is a public agency as defined in Kansas law. (Video is at Kansas Open Records Act at Wichita City Council.) Then-council member Paul Gray, after noting that he had heard all council members speak in favor of government transparency, said that even if WDDC is not a public agency under the law, why can’t it still proceed and fulfill records requests? This is an important point. The Kansas Open Records Act contains many exclusions that agencies use to avoid releasing records. But agencies may release the records if they want. Any council member could have made the motion that I asked for. But no one, including Gray, former council member Sue Schlapp, former member Jim Skelton (now on the Sedgwick County Commission), Mayor Carl Brewer, and council members Jeff Longwell (district 5, west and northwest Wichita), Janet Miller (district 6, north central Wichita), and Lavonta Williams (district 1, northeast Wichita) would make a motion to increase government transparency and citizens’ right to know. Wichita city manager Robert Layton offered no recommendation to the council. He recommended to the council, as I did, that the contract be contingent on Go Wichita following the Kansas Open Records Act. Discussion on this matter revealed a serious lack of knowledge by some council members regarding the Kansas Open Records Act. In remarks from the bench James Clendenin (district 3, southeast and south Wichita) asked the city manager a series of questions aimed at determining whether the city was satisfied with the level of service that Go Wichita has provided. He then extended that argument, wondering if any company the city contracts with that is providing satisfactory products or service would be subject to “government intrusion” through records requests. Would this discourage companies from wanting to be contractors? First, the Kansas Open Records Act does not say anything about whether a company is providing satisfactory service to government. That simply isn’t a factor, and is not a basis for my records request to Go Wichita. Additionally, the Kansas Open Records Act contains a large exception, which excepts: “Any entity solely by reason of payment from public funds for property, goods or services of such entity.” So companies that sell to government in the ordinary course of business are not subject to the open records law. Go Wichita is distinguished, since it is almost entirely funded by taxes and has, I believe, just a single client: the City of Wichita. Finally, we should note that the open records law does not represent government intrusion, as Clendenin claimed. Open records laws offer citizens the ability to get an inside look at the working of government. That’s oversight, not intrusion. Pete Meitzner (district 2, east Wichita) asked that there might be a workshop to develop a policy on records requests. He expressed concern that departments might be overwhelmed with requests from me that they have to respond to in a timely fashion, accusing me of “attempt to bury any of our departments in freedom of information acts [sic].” Such a workshop would probably be presented by Wichita City Attorney Gary Rebenstorf. His attitude towards the open records law is that of hostility, and is not on the side of citizens. In making this argument, Mr. Meitzner might have taken the time to learn how many records requests I’ve made to the city. The answer, to the best of my recollection, is that I made no requests that year to the city citing the open records act. I have made perhaps a half-dozen informal requests, most of which I believe were fulfilled consuming just a few moments of someone’s time. As to Meitzner’s concern over the costs of fulfilling records requests: The law allows for government and agencies to charge fees to fulfill requests. They often do this, and I have paid these fees. But more important than this, the attitude of council member Meitzner is troubling. Government should be responsive to citizens. As Randy Brown told the council, government should welcome opportunities to share information and be open and transparent. Michael O’Donnell (district 4, south and southwest Wichita) made a motion that the contract be approved, but amended that Go Wichita will comply with the Kansas Open Records Act. That motion didn’t receive a second. Brown and I appeared on the KAKE Television public affairs program This Week in Kansas to discuss this matter. Video is at In Wichita, disdain for open records and government transparency. In Kansas, when citizens believe that agencies are not complying with the Kansas Open Records Act, they have three options. One is to ask the Kansas Attorney General for help. But the policy of the Attorney General is to refer all cases to the local District Attorney, which is what I did. The other way to proceed is for a citizen to pursue legal action at their own expense. After 14 months, Sedgwick County DA Nola Foulston’s office decided in favor of the governmental agencies. See Sedgwick County DA Response to KORA Request to Wichita Downtown Development Corporation. When newspapers have their records requests refused, they usually give publicity to this. The Wichita Eagle is aware of my difficulties with records requests in Wichita, as their reporters have attended a number of meetings where my records requests were discussed, sometimes at length. But so far no coverage of an issue that, were the newspaper in my shoes, would undoubtedly covered on the front page. Something tells me that KPI won’t get any coverage, either. The issue of school fund balances in Wichita and Kansas is a serious issue that deserves discussion. At the same time, we need to make sure we don’t lose sight of Kansas school issues that are even more important. But school officials need to be held accountable for their deception of the public, most notably through straw man arguments. When Dr. Walt Chappell, an elected member of the Kansas State Board of Education, used a slot on the public agenda to address the board of USD 259, the Wichita public school district, his shabby treatment by the board was one issue. But the more important issue is the substance of Chappell’s remarks, and the reaction by school district officials. The Wichita school district, like many across the state, has unused balances in a variety of funds. Some of these funds, by law, must be used only for certain purposes. But this year the Kansas Legislature passed a law that gives school districts greater flexibility in using these fund balances. 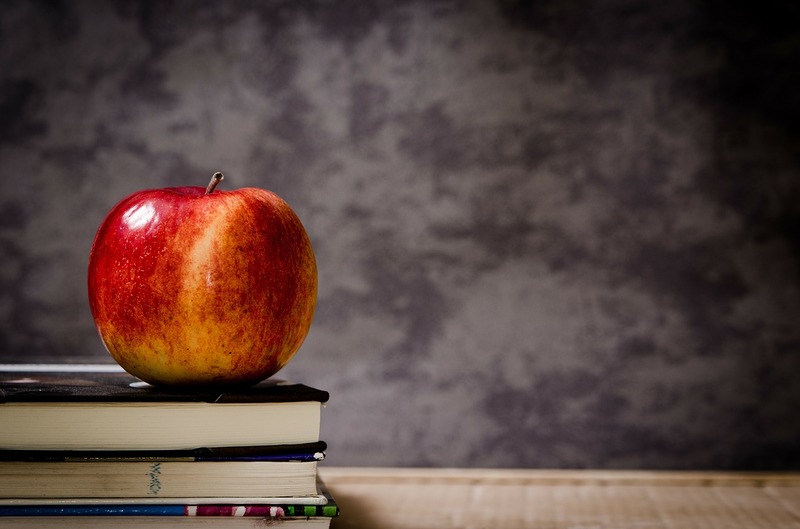 Even through the unused fund balances have been restricted to certain uses, school districts have always been able to “spend” them by simply not transferring so much to the funds. But there’s been an incentive to make transfers to these funds, as once the money is in certain funds, school districts can hoard it. Everyone can understand that. The need for fund balances to manage cashflow is legitimate and not part of the argument of those who advocate using fund balances for other purposes. For Rogers to use this as part of his argument is an example of a straw man argument. In using this fallacy, Rogers replaces his opponent’s argument with a “superficially similar yet unequivalent proposition.” Then he refutes it. The appearance, if you’re not watching carefully, is that Rogers has refuted the original argument. But he hasn’t. This is what the arguments of Rogers and the school spending lobby don’t explain: Why do the fund balances rise year after year, and rise faster than the overall level of school spending? The only explanation is that money is added to the funds faster than it is spent, year after year. Schools have not spent all the money we’ve sent them — despite their constant poor-mouthing. This issue, while important, is not the most serious issue facing Wichita and Kansas schools. For example, most people would be surprised — and shocked — to learn that only 26 percent of Kansas students that take the ACT test are ready for college-level coursework in all four areas that ACT considers. (See Most Kansas students not ready for college.) While this result was slightly better than the national average, it means that three-fourths of Kansas high school graduates need to take one or more remedial college courses. For more articles on the fund balances, click on Kansas school fund balances. Chappell’s written remarks are below (use the toolbar to zoom or for a full-screen view), and video of his appearance before the Wichita school board follows that. Recently USD 259, the Wichita public school district, placed five month’s of checkbook register data on its website. This is a good move, and we should thank the district for doing this. 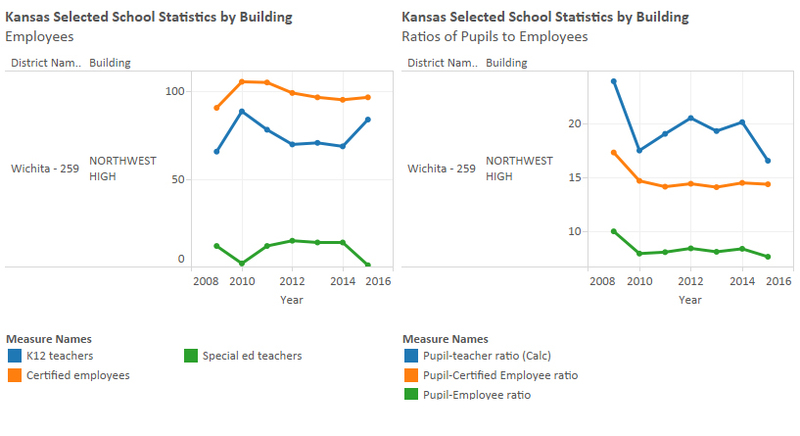 But we need to remember that the Wichita school district is very late in making this transparency effort, and the district’s past attitudes towards citizens needs to be remembered. In the past, the district has made this checkbook information available each month. It was made available as a pdf document, which is not nearly as useful as an Excel spreadsheet, which is the format of the most recent months. Furthermore, the pdf documents would be on the district’s website for less than a week. Board member Lynn Rogers explained that the district didn’t have space on its servers to hold these documents. That explanation is total nonsense, as the pdf documents are a mere fraction of the size of video files that the district hosted on its servers. That type of misinformation is what citizens have come to expect from Rogers and the rest of the district. Not only misinformation, but hostility towards citizens and their records requests. Rogers has told citizens that records requests are a “burden” on the Wichita school district and interfere with its ability to educate children. Other frustrations with getting information from the Wichita district and its interim superintendent Martin Libhart led me to conclude, as the title of an article: Wichita School District: Accountability is on Our Terms. So while citizens should thank the Wichita school district for its recent actions, we’ll have to wait a while to see if the prevailing attitude of hostility towards citizens and their requests for information disappears. 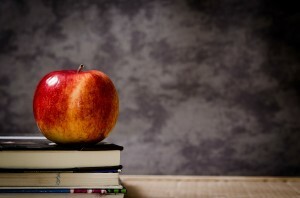 On Wichita school board, are only supporters’ opinions welcome? At this week’s meeting of the Wichita school district board, member Lynn Rogers criticized the Wichita Eagle for printing a story that include criticism by an opponent from the 2008 bond issue campaign without disclosing his involvement in that campaign. Is Rogers’ criticism relevant? Should only those who blindly support everything the Wichita school district does have a voice? I don’t think so. But if we’re talking about transparency and disclosure, let’s put it all out in the open. Has the Wichita school district disclosed that the school district’s partner in this land transaction contributed to the bond issue campaign? Michael Monteferrante and his wife contributed $500 to that campaign. I haven’t seen this reported, and I don’t think the Wichita school board disclosed this either. Recently a comment was left on this blog claiming that children in the Catholic school system who are problems are kicked out and end up in the public school systems. The writer didn’t make any claim as to the magnitude of the number of students, but readers are led to conclude that it’s enough to be a problem for the public schools. So what’s the true story? 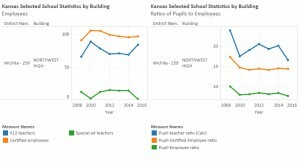 Last year I took a look at the numbers in Wichita school expulsion myths. At Monday’s meeting of the board of USD 259, the Wichita public school district, board president Lynn Rogers said he wants to have a discussion about ending balances, in particular unencumbered funds. He said there is misunderstanding in the community, during the bond issue campaign last year, and now with a state school board member. He added that he wants to communicate the meaning of this to the public. Rogers didn’t mention the state school board member by name, but I think I can guess who he’s referring to. You can view the member’s less-than-cordial treatment at a recent Wichita school board meeting in this YouTube video. There’s a problem at the Wichita school board meetings, as there also is at meetings of many other government bodies. Citizens — even a Kansas State School Board Member — have to speak first, and briefly at that. Then the board members, superintendent, and staff get to speak without fear that the citizen will be able to ask questions, rebut arguments, or just call plain old nonsense for what it is. A group in Wichita is considering a public forum to discuss this issue. Hopefully this event will take place, and representatives from the school district will participate. The alternative is more meetings where one side only is in control of the agenda, the message, and the flow of information.